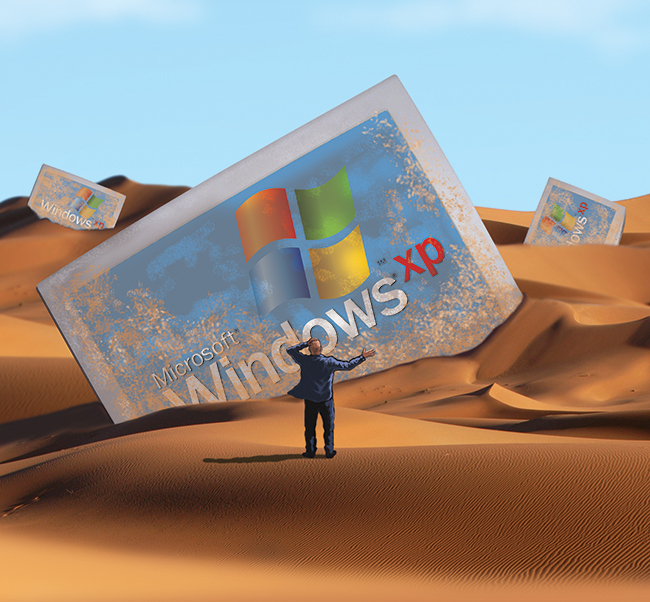 Are you ready for the “XP Apocalypse” on April 8? That’s when Microsoft plans to stop issuing security updates for the aging, but still popular XP version of its flagship Windows operating system, which by some estimates is still running on nearly one in three personal computers in homes and offices around the world, along with some bank ATMs and other commercial systems. Security experts say those machines will become significantly more vulnerable to viruses, spyware and other malicious hacks once Microsoft withdraws its support. No one’s predicting a Mayan-style cataclysm, but if you’re still using XP, here are some things to consider. Microsoft started selling XP back in 2001 — long before the much-maligned Vista and two subsequent versions known as Windows 7 and Windows 8. The company says it’s already overextended the natural life cycle of XP, while newer versions of Windows offer better security and performance, especially when it comes to newer Web services and touch-enabled programs. Even so, many consumers, businesses and government agencies have seen no reason to replace XP on their desktop and laptop computers, according to research firm NetMarketShare, which says XP powers nearly 30 percent of all personal computers worldwide. Others estimate 200 million or more XP users. While McGuire is skeptical of the more dire warnings about XP, other experts say there’s reason to be concerned. Several makers of antivirus programs and other security software say their products will continue to work with XP, but they may not provide full protection. Security programs can detect and neutralize malware, but they don’t repair vulnerabilities in the underlying operating system, said Gerry Egan, senior director of product management at Symantec, which “strongly recommends” that XP users upgrade to a newer operating system. Like most software companies, Microsoft issues regular security updates or “patches” for Windows, which it distributes through free downloads as new vulnerabilities are found. It plans to stop doing this for XP, while continuing to release updates for newer Windows versions. That in itself could create a road map for hackers to attack XP, said Egan, because some vulnerabilities may affect more than one version of Windows. When Microsoft issues a patch for a later version, he predicted, hackers will check to see if they can exploit the same, unpatched weakness in XP. Computers running XP “will be an easy target for hackers” and could even be taken over by bots, or automated programs that disguise their malicious nature to infect other PCs running newer operating systems, said Ondrej Vlcek, chief operations officer at antivirus maker Avast, in a recent blog post. With the April 8 deadline looming, XP users have some options. One is to finally get a new version of Windows. Microsoft, of course, hopes people will buy the latest version, although Windows 8 has a drastically revamped interface that longtime XP users may find confusing. It also requires more memory and processing power than some older computers can provide. Windows 7 is a closer cousin to XP, but it was first sold in 2009 and is getting hard to find. Amazon, for example, only sells Windows 7 in a kit that must be installed on a new hard drive or one that’s been wiped completely clean — a tricky process beyond many consumers’ expertise. More user-friendly installation kits may be available if you look. Stan Reynolds at On Balance, a Walnut Creek repair shop, said he can provide and install Windows 7 on an older PC, although it will cost several hundred dollars. Given the cost and trouble of installing a new system, some XP users may opt to just buy a new PC, with modern hardware and software already on board. While many retailers promote the latest models running Windows 8, some stores still have machines with Windows 7. There are also desktops and laptops with rival operating systems from Apple and Google — or, for less money, a tablet or e-reader might suffice. First, be sure to use an updated anti-malware program; some experts recommend using two, since one may find things the other misses. Microsoft Security Essentials is a free anti-malware program that you can download now; you won’t be able to download the XP version after April 8, although Microsoft says it will distribute updates for an unspecified time. Second, switch to Google Chrome or Mozilla Firefox for Web browsing. Both will continue to work with XP and have the latest browser security features. The two most recent versions of Microsoft’s Internet Explorer won’t work with XP, while older versions of Explorer don’t work as well with newer websites. Finally, stick to trusted websites and avoid using an XP computer for online banking, shopping or anything involving sensitive information. Better still, disconnect from the Internet and just use the computer for word-processing, spread sheets or games that are already installed on your machine. If you must keep using XP: Make sure you’ve got updated anti-malware programs, use Chrome or Firefox to browse the Web, and don’t store or transmit sensitive information on your PC. Better still, disconnect from the Internet and only use software that’s already installed. Consider upgrading to Windows 7 or 8, but be advised: Windows 7 is getting harder to find, and older computers may lack the memory and processing power to support Windows 8. Maybe it’s time to buy a new computer: Check out the new Windows-based PCs, or maybe a Mac or Chromebook (which use operating systems from Apple and Google). For smaller budgets, consider a tablet.